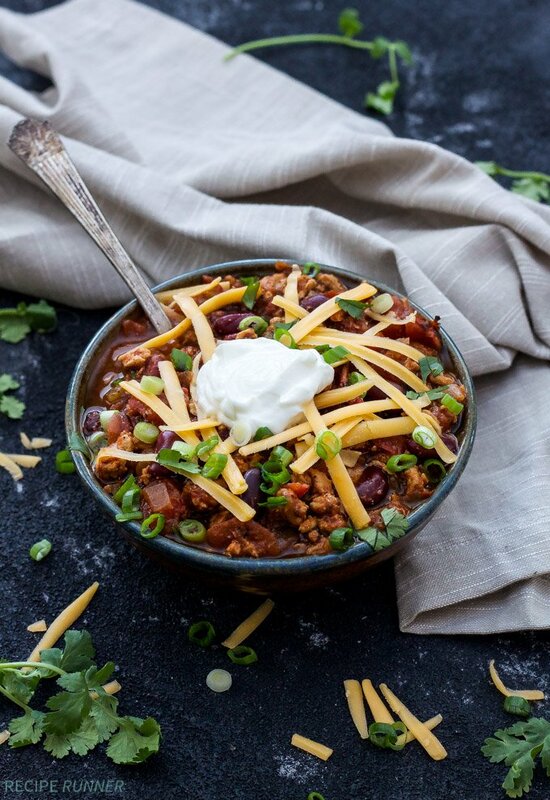 You won’t miss the extra fat and calories in this hearty and flavorful Healthy Slow Cooker Turkey Chili! Full of lean ground turkey, fire roasted tomatoes, kidney beans and more, it sure to become a family comfort food favorite! 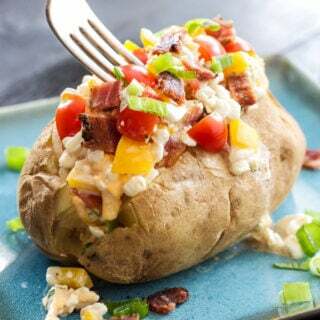 With the Super Bowl being only a couple weeks away I thought I better share a couple party worthy recipes that you and your friends will enjoy chowing down on during the big game. Speaking of the big game did your team make it? If they did it will make the game that much more exciting to watch, but even if they didn’t you can still make the 4 hour event worth your time by eating all the game day food! 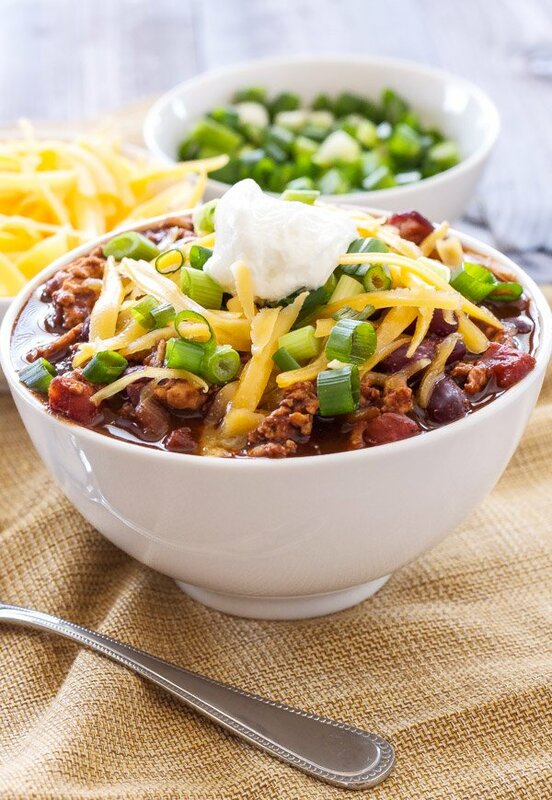 Chili is always a good choice as a main dish to go along with all the chips, dips and other appetizers. 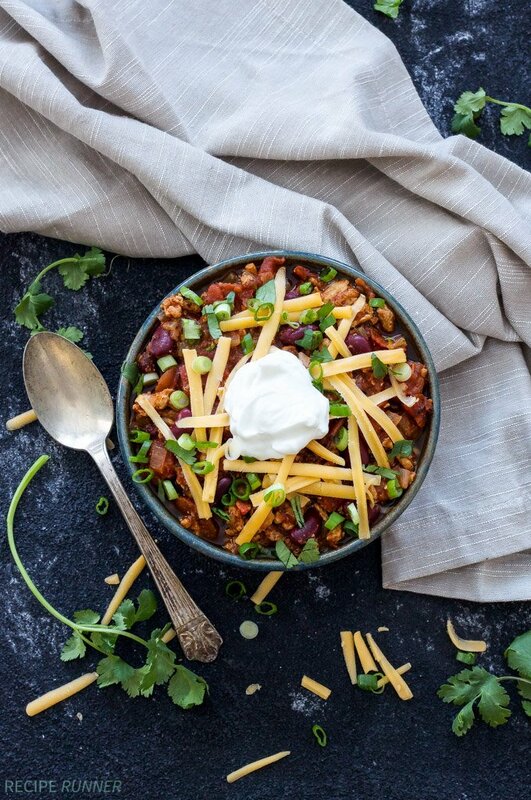 Since we’ll all be consuming 10,000 calories worth of appetizers and beer, let’s at least have a hearty and good for you main dish, which is exactly what this Healthy Slow Cooker Turkey Chili is! I know everyone has their own special recipe for chili, but this one is definitely worth giving a try. When you go to search for a chili recipe on the internet you’re bombarded with 8.5 million results…I checked. Seriously, that’s insane! I honestly didn’t think it was possible for there to be so many chili recipes. My recipe for chili is a combination of the recipe from my grandma’s cookbook along with some of my own additions. That’s the great part about making your own chili, you can tweak it and add or eliminate ingredients until you get it just the way you like it. I think we can all agree though that chili tastes better the longer it cooks and that the leftovers generally taste better than the day you made it. 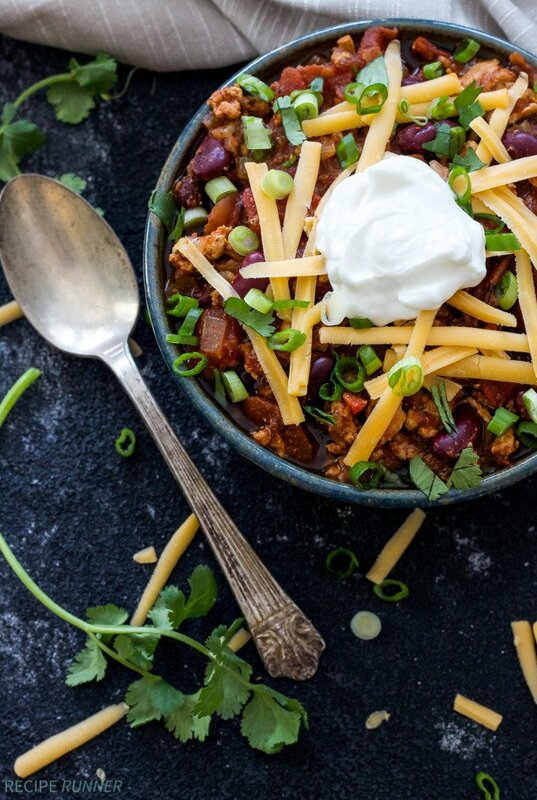 So, let’s talk about this turkey chili. My grandma’s recipe originally called for ground beef, but since I prefer ground turkey I subbed it in. I also replaced regular diced tomatoes for fire roasted ones because I love the smokey flavor it adds to the chili. 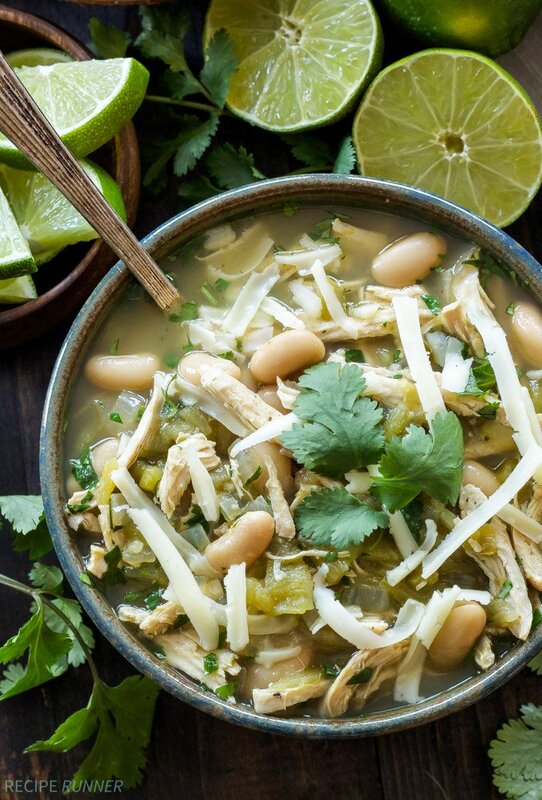 The final changes were using a can of diced green chiles instead of a bell pepper, adding in some coriander and using low sodium chicken broth instead of beef since this is a turkey chili. 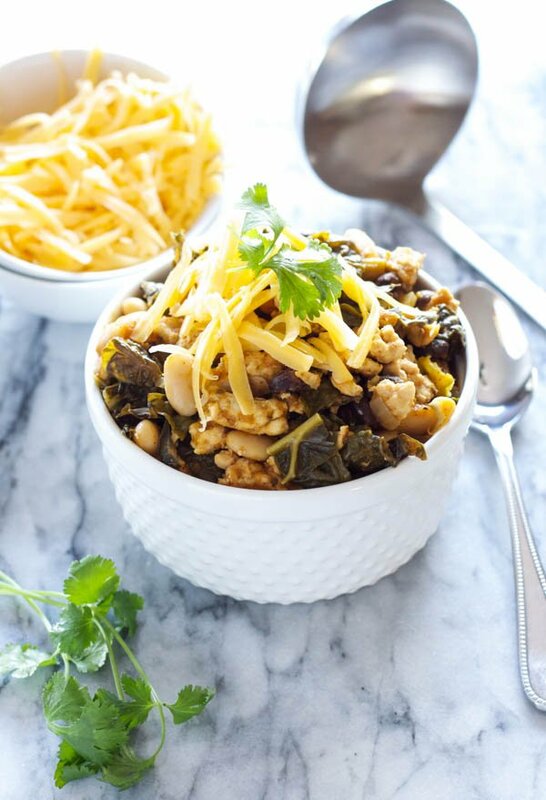 The changes I made give the chili a little bit of Southwest flavor, which I love! My grandma’s recipe didn’t say anything about sticking it in a slow cooker, I actually don’t remember her using one all that often. However, slow cookers are perfect for meals that need to cook a long time like chili. Just brown your onions, turkey and garlic in a sautè pan, then add it to the slow cooker along with the rest of the ingredients and let it cook on low for about 6 hours. 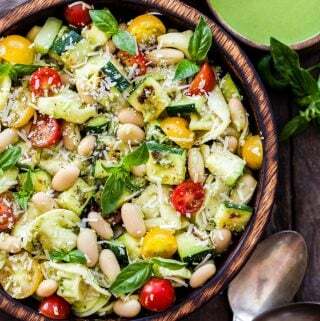 Start this recipe in the morning when you wake up and it will by bubbling and ready to serve just in time for the big game! Preheat a large sautè pan with the tablespoon of oil over medium high heat. When the pan is hot add in the diced onion and stir until it starts to soften, about 2 minutes. Add in the ground turkey, minced garlic, all the spices, salt and hot sauce. Break up the turkey into small crumbles with a wooden spoon and stir everything together so that it's coated in the spices. Once the turkey is almost cooked through pour the mixture into your slow cooker and add in the remaining ingredients. Stir everything together then cover with the lid and set on low for 5-7 hours depending on how fast or slow your slow cooker cooks. 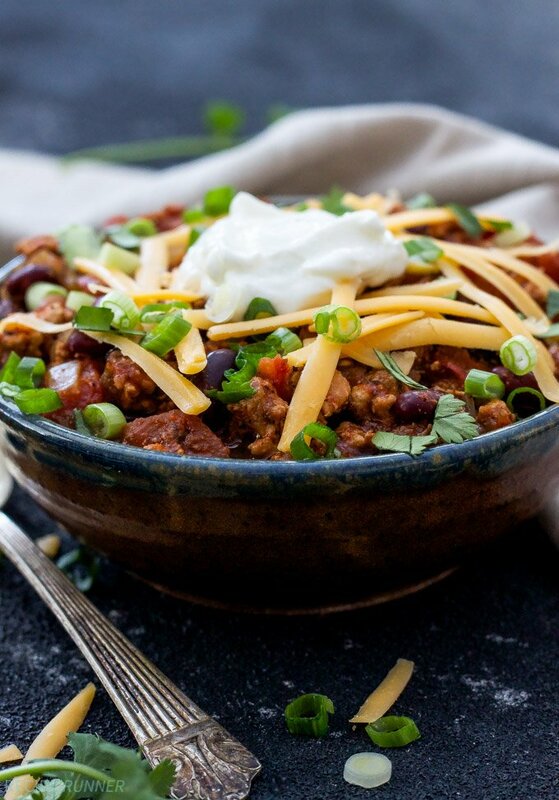 Serve the chili topped with shredded cheese, green onions, cilantro and plain Greek yogurt or sour cream if desired. This cold weather has been killing me! (Yes, it's been in the 20's and 30's here.) 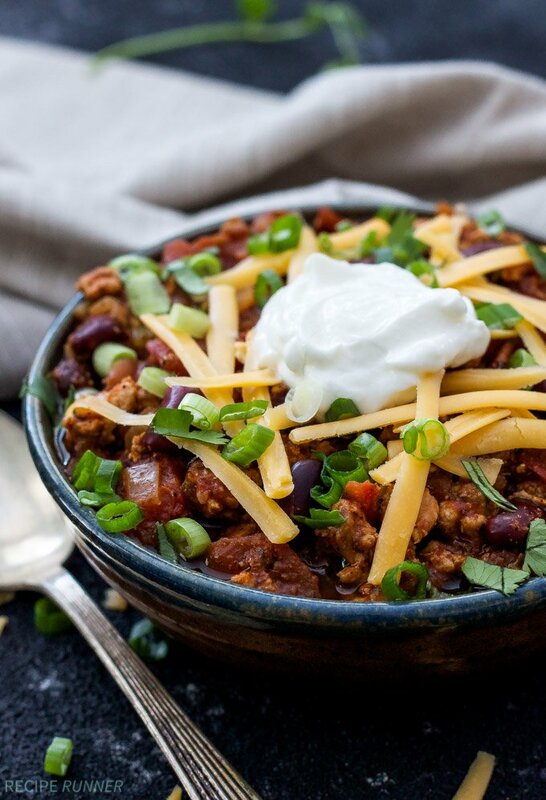 I just want to curl up on the couch with a big bowl of this turkey chili. I will definitely have to add this to my slow cooker this week! Whoa girl, that is pretty cold! You definitely need a bowl of chili. Stay warm! I love how customizable chili is!!! And I love how thick and chunky yours looks! That's how I like it too!!! Thanks Jocelyn! Chunky chili is the best! I LOVE slow cooker chilis and how chunky yours turned out. 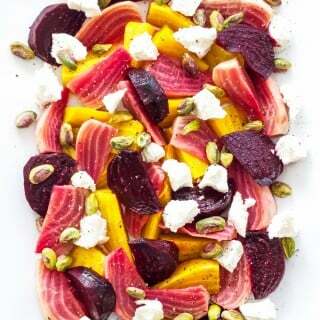 Time for me to bust out the slow cooker to make this! Thanks Lisa! I'm so happy someone was genius enough to create the slow cooker! This chili looks amazing. Seriously, your photography is so beautiful! I love making chili, it is one of my favorite meal prep staples because it is good all week long. I love the changes you made - slow cooker chili is the best! Thanks so much Les! I think my favorite part about chili is the leftovers and how they taste even better than the day you made it! Oooh I LOVE me a chunky chili and your's is sure to hit the spot! Also love your subs of turkey, diced green chiles and coriander! Thanks Shashi! I always love adding in some Southwest spice to my food! Mine's in the slow cooker right now! WOO! It's 85 degrees here (SoCal) but my husband and I are trying to eat healthy and I'm pretty sure this is going to be a GREAT alternative to our meal prep boxes (I'm so sick of brown rice and broccoli) ! Looking forward to it! Thanks Monica, I hope you enjoyed the chili!